If people did not have to work, what would motivate them to work? In industrialized countries around the world, "work" appears to be something that most people try to avoid as much as they can, dreaming of winning a lottery so they will never have to work again -- and be free to do nothing or do what they like. Money serves as a motivator for work, because in these cultures you need money to stay alive, or at least to live well. Many social welfare states pay a basic income to people unable to find work. Despite the fact that usually this basic income is not unconditional but a transitional payment only and bound to the receiver's attempts to find a job, there is quite a lot of hostility from those who force themselves to their jobs each morning, towards those who appear to be happy with having little and prefer not to work. If everybody received an unconditional basic income that was high enough to make their lives reasonably comfortable, what would incite people to do the work (like baking bread) that needs to get done? how those that like to laze around can be motivated to work without need. B.F. Skinner in his utopian novel Walden Two attempts to design a society where no-one is required to work more than four hours a day and unwanted jobs result in more credit points than desirable jobs, so that some people clean the toilet and then have more free time than those working at their dream jobs, but this concept relies on a virtual currency of points that you have to earn, so there is a need to work to earn your living, even if it does not have a payment of traditional "money". In my question, the motivator for work must not be anything that has to be fulfilled, but something that does not take away the freedom not to work. Something that makes even the least desirable job attractive. In the case of the toilet it might be something simple like this being your toilet, and if you don't clean it, you'll have to use it anyway. But there are public toilets. What would work there? If you take a look at games like minecraft, they have quite a lot of players who do not work (students, college students, etc). These people first mine thousands of blocks, then rearrange them in a creative way. There's absolutely no need to do so, it is entirely voluntary, yet people end up moving hundreds of thousands of blocks to do something creative or to fulfill their design. 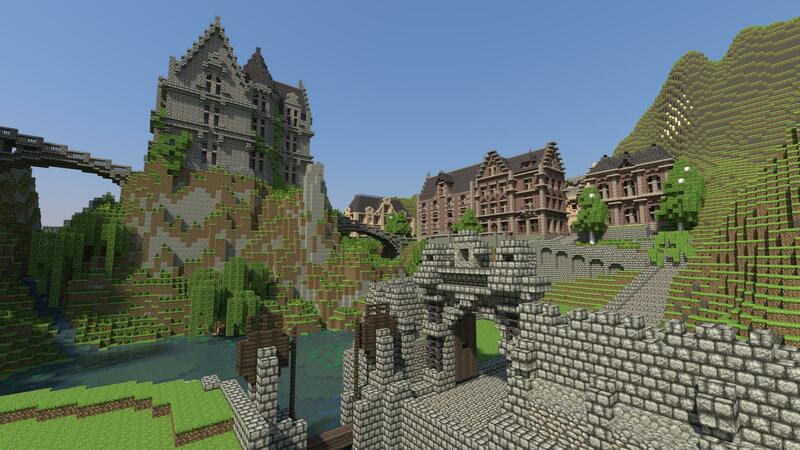 Players of minecraft explore the game environment, make tools, extract raw resources and ultimately make virtual structures like in the image below. Statistically speaking, minecraft has more players(11 million paid users) and instructional videos(with millions of views) on YouTube than any other game I know of. From this, it appears that in a world without need to work, creativity, design and "market of 1 person" would motivate people to do something. Cleaning toilets is not such thing. Maybe painting toilets, or designing them is. The hostility is real but the premise that more than a small minority of people forgo “working” by laziness is in fact very questionable, in several ways. People might dream of winning the lottery but there is very little evidence that they generally avoid “work”. In fact, with the same income, people who are unemployed report being less happy than people who have a job. There are however reasons to think that the eagerness with which someone looks for a work of the “traditional” salaried kind might be endogenous. If there is no job to be found, then you will stop looking for one and exposing yourself to constant humiliation (see this post by Chris Dillow for some evidence on this). This is unrelated to some pre-existing “preference for work” or fundamental psychological “laziness”. Psychologically, it could be related to “learned helplessness”. Another obvious issue is that to the extent that unemployment benefits or basic income give an incentive not to work, it would only have a strong impact for people close to this level. There is no invariant threshold beyond which needs are met and whatever this basic income, there would therefore still be an incentive to earn more. In fact, people have been predicting that we would soon satisfy all our “basic needs” and work much less for quite some time (just came across one such prediction from Keynes, writing in the 1930s). In some sense most people today are richer than the elite of a few centuries ago (certainly in Europe) and yet this hasn't happened. We are very sensitive to our position in society, just create perceived “needs” all the time, etc. A static view of needs, incentives and motivation just isn't enough to account for that. Also completely ignored is the problem of what counts as “work” in a society. Many people are already very busy doing things that aren't recognized as proper work. In fact, whether it is domestic production, charitable or creative activities or simply sports or “hobbies”, very few people if any are completely inactive, barring clinical depression or debilitating illnesses. The simple answer to the first question is therefore “100%”. There is no need for some “laziness” trait to explain being busy or not, the main issue is what activities are deemed productive or deserving in a particular society and about fairness in the distribution of income (“They are going fishing with our money”). Note that no matter how time-consuming they are, many activities regarding as feminine like caring for children or homemaking are still not considered “work”, not fully at least. Incidentally, the appeal of the lottery and the reason some people might stop working after winning it is that it's not just making you comfortable, it's making you (what feels like being) filthy rich. It's therefore not a good model to understand ordinary decisions about work. Furthermore, as far as I can tell, people who are very rich (and not somewhere between a poorly paid job and welfare or even merely having above-average income) are not particularly inactive. Many work long hours although they could be “comfortable” working less or not at all, some work very late in life, others might engage in activities that would not be regarded as “work” but are pretty exhausting nonetheless (say golfing around the world). Some of these activities might be regarded as work, others might be classified as leisure, deserved or undeserved (i.e. “being lazy”), but in any case people do not engage in them merely to reach some comfortable income and stop there. Finally, there is a direct contradiction between your notion that some works “needs” to be done and your search for a motivation “without need”. If nobody bakes bread and you want to eat some, then you need to bake it. In fact, no matter what monetary income you might provide, if nobody produces anything then this money is worth nothing and certainly won't be enough to buy bread and live comfortably. The “problem” therefore takes care of itself and it makes these things-that-need-to-be-done-but-that-nobody-needs-to-do purely theoretical. This is why “income high enough to make their lives reasonably comfortable” is kind of begging the question. We just live in a particular time, place, and society. You cannot meaningfully abstract that away and say anything interesting, let alone get “empirical” evidence on some abstract situation that bears no resemblance with actual human experience. working is doing something and trying to be remembered, much like Picasso, Einstein... Every human would want to do something in his life, something to be remembered for, everyone wants to make a change, make a difference, the ultimate dream of every human being able is to change the world. And that's why they work. Every human on this earth is somewhat egoist, our ego tell us to work, be remembered, be one of the greatest ever been, we work for the hope that someone will remember us after dying, and not just disappear, like we have never existed. Doing creative and unique(new) things will motivate you. But only if there is another person or living/virtual "creature" that can appreciate that or you can tell/show it to that "creature". I don't consider taking drugs or other stimulants/inhibitors to make you do something, because it's a distorted will or changed behavior and not your own will. Human brain will probably loose all reasons to continue supporting the body etc. when you start loosing the "purpose" of life. Which is basically to replicate (have children etc.) or help others. E.g. when you are isolated very long time alone, you might start to have suicidal thoughts. That's why a lot of prisoners that are being sentenced to 20 or more years often commit suicides. But every other answer to this question from others is valid too. Do personality survey responses correlate to the success or failure of minimum wage employees? What is the most effective maximum work duration per day? Why does clickbait use numbers? Evolutionary motivation for the existence of pleasure? What cognitive abilities show the smallest B-W differences in mean scores? What are ways to assess employability of workers? Does getting any job (no matter how demeaning) builds up one's character?